Discussion in 'Dungeons & Events' started by mageofthesands, Apr 15, 2018. We're back! They're back! Many banner, many relics, but how many pulls? One banner for every realm. The FF1 banner has 23 items on it. Two of those are chains. It's one of the better realm banners. Nope, I only want Chant from the FFT renewal banner. That's almost 10% per x11 pull! Probably not since the chances for disco balls are considerably lower than 5* stuff. Really? I know that on regular draws SSBs have double chance of coming up, but I thought that in most draws the chance of drawing each relic was thought to be equal. Also: why don't we know this as a fact? I thought Apple at least requires gacha chances to be posted in the app. That's one of those features I really like from Opera Omnia. 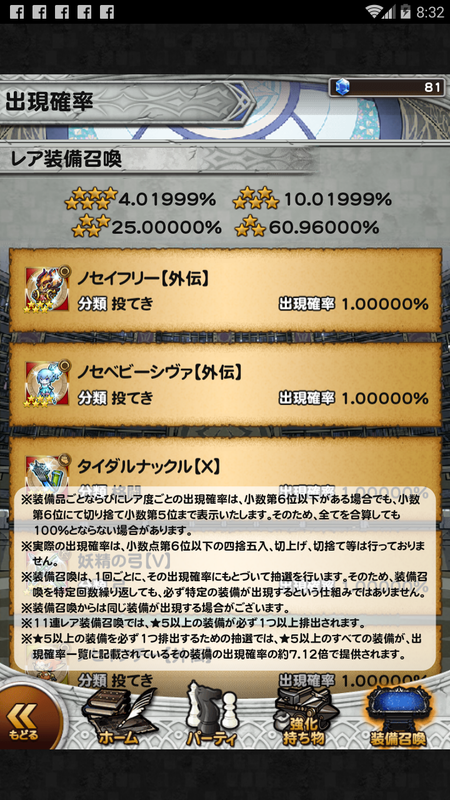 From what I remember, 6* items have a 1% chance of dropping, while 5* ones have a 2% chance. This is directly from the JP client for a normal event banner. Sometimes the rates change depending on banner type. Is that a regular banner, or a relic pool? By a "regular event banner" you mean a 14-relic banner with 4 6-star relics? So this would indicate a equal 1% chance per relic on the banner, right? Thats a regular, not a pool. So is that per single draw or per x11 draw? Thats what it is per single orb that goes up, doesnt matter how many. 100 Gems. I got a reforged Tiara which is okay for stats even if it lacks +element. The dupe Onion Sword is going to be a rosetta stone most likely. I don't need to combine it for RS I think given I have 6* base spear, katana, and sword for the realm. Cecil's weapon is my third +holy 6* base sword, so Knight Squad is even more powerful. I'm hurting for synergy on that realm anyway. I got junk on FFII and FFV.